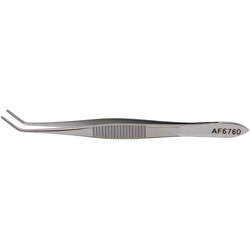 Nugent stainless steel utility forceps have angled shafts with 45-degree angled jaws. Jaws are available in both serrated and smooth and are 10mm long. Flat, narrow handle. Overall length: 108mm.